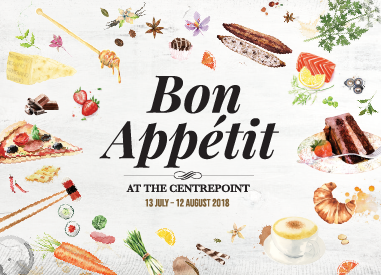 From 13 July to 12 August 2018, sit down to a great meal and redeem great rewards, ranging from gift cards to retail vouchers and exclusive dining discounts at The Centrepoint! Receive a $10 retailer voucher redeemable at Customer Service when you spend a minimum of $80 and scan your Frasers Rewards QR code at participating stores. Update: The $10 retailer vouchers have been fully redeemed. Receive a $50 digital gift card when you spend a minimum of $180 (including a transaction of at least $50 from a F&B retailer) and scan your Frasers Rewards QR code at participating stores. Limited to 50 redemptions per weekday and 100 redemptions per weekend. Redeem free 1st hour parking on weekdays. Limited to the first 200 redemptions per day. Stamp your way to great rewards using The Centrepoint Food Trail Stamp Card! Book with Chope and get a bonus 400 Chope-Dollars (equivalent to a $10 voucher) when you dine at participating restaurants at The Centrepoint. Limited to 100 redemptions per participating restaurant. Limited to the first 3,000 redemptions per Frasers Rewards member per day regardless of total amount spent. Present your Frasers Rewards QR code in the Frasers Rewards app and original receipt(s) to verify transaction details scanned to the same account in Frasers Rewards app in person on the day of purchase at Level 3 Customer Service to redeem a $10 retailer voucher. In the absence of your Frasers Rewards QR code, you may present your NRIC / FIN. Minimum $180 spent at participating stores (including a transaction of at least $50 from a F&B retailer). Present your Frasers Rewards QR code in the Frasers Rewards app and original receipt(s) to verify transaction details scanned to the same account in Frasers Rewards app in person on the day of purchase at Level 3 Customer Service to redeem a $50 digital gift card. In the absence of your Frasers Rewards QR code, you may present your NRIC / FIN. Minimum $50 spent at participating stores. Limited to a single free 1st hour parking redemption per Frasers Rewards member per day regardless of total amount spent. Present your Frasers Rewards QR code in the Frasers Rewards app and original receipt(s) to verify transaction details scanned to the same account in Frasers Rewards app in person on the day of purchase at Customer Service Counter to redeem free 1st hour parking. In the absence of your Frasers Rewards QR code, you may present your NRIC / FIN.